United on the attack here in their last pre-season game of the summer a week before United kick off the 2009-10 season for real. 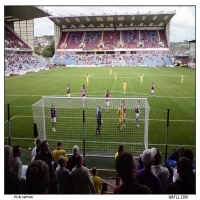 United were playing Burnley in their final pre-season game of the summer on August 1st, 2009 at Turf Moor. Burnley freshly promoted to the Premier League faced a Leeds United without Luciano Becchio and Fabian Delph who both were reported to have picked up knocks in training. It was United's American striker Mike Grella who opened the scoring just after the half hour mark putting Leeds deservedly in the lead as United dominated play in the first half. It wasn't until the second half when Burnley finally had a shot on goal but it was United who continued to boss the game and on 70 minutes midfielder Andy Robinson who had only been on the field 7 minutes netted Leeds' second. That second goal for Leeds prompted the Burnley manager to ring the changes and on 76 minutes Burnley scored against the run of play. Robinson was unlucky not to get his second, United's third soon after but was beaten by the linesman's flag. 7,899 watched United win away, with a Mighty White following for the men in yellow. Leeds United: Ankergren, Crowe, Marques, Kisnorbo, Parker, Hughes, Howson, Prutton, Johnson, Showunmi, Grella. Subs: Michalik for Marques, Snodgrass for Crowe, Huntington for Kisnorbo, Robinson for Johnson, White for Parker, Sheehan for Showunmi. Thanks to Hartley for this great pic. The United fans pack their end at this pre-season friendly with Burnley at Turf Moor here before the 2007-08 kicked off for real. United lost the game 2-0 in front of 5,290 supporters with a massive showing of support for the Whites. The panicked Burnley officials at one point ran out of tickets, according to them they said they wasn't expecting that many Leeds fans to turn up. Just under 2,000 United fans made the trip many of them from the wrong side of the Pennines. During the game the Leeds fans held a protest against Chairman Ken Bates chanting 'Get the Chelsea out of Leeds' in reference to the links that Bates and manager Wise have had with the side in the past. 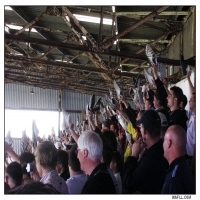 Then later the United fans took a comedic approach with 'Shoes off if you hate Ken Bates' which prompted many fans to remove their shoes and wave them in the air. The protests followed the release of fresh details regarding Bates' shady purchase of Leeds United.